To be precise, I pulled this one out of the stack of LP's a few weeks ago and ripped it, but finally finished the splitting and encoding tonight, so the post title isn't entirely inaccurate. To the untrained eye, this is a typical album for the date-of-release (1980) -- decent power pop in the Nick Lowe vein. However, the lead singer might stir some earlier memories. The guy in the red shirt and pants on that cover is Peter Noone, famed in song and story as the lead singer of Herman's Hermits, the British Invasion version of Rodney Dangerfield, in that they get no respect. Justified to some extent, since the Hermits were quite callously manipulated by manager Mickey Most to maximize profits, but a close listen to any Hermits album reveals some nice rocking. By 1980, Peter was a has-been at a far earlier age than anyone should be. Becoming a household name at 16 does that to you, I suppose. (16!?! My son is 16. Arrgh!) The Tremblers may have been his attempt for some credibility, but it sank without a trace as far as I know. Listening to it now, it's a shame that it did. Most songs are at least co-credited to Noone, and the band does a decent job with most. Peter still had a too-sweet voice for outright rocking, but it's not bad at all. And the band has to earn some points for the album's one cover song, Elvis Costello's Green Shirt. I've always liked Noone, and the Hermits as well. I was exposed to them early on -- my older sister was a big fan, pasting pages from 16 Magazine on her wall, and playing 45's of A Must to Avoid and Dandy until we ALL knew the lyrics. That's probably why I bought this album when it came out. But it did get quite a few spins on the turntable on its own merits, and I'm glad it's digitized and part of my shuffle now. In a bit of synchronicity, I had already started digitizing this album when I sat down to watch American Idol with my daughter the week that Peter Noone was a guest. It did make me feel a bit old when Liza Persky at Idol Critic had no idea who he was. 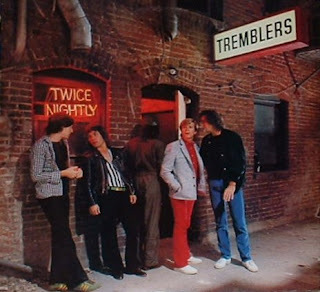 I just discovered the Tremblers tonight....only 28 years late. Peter Noone WHAT A TALENT!!! I fell in love with Peter Noone and his music and looks when I was 13...now I'm ???? And guess what, I'm still in LUV with him. This is the talent we need today. Kids wake up!! !